It's so sad when good friends leave after you have had such an awesome extended weekend with them. 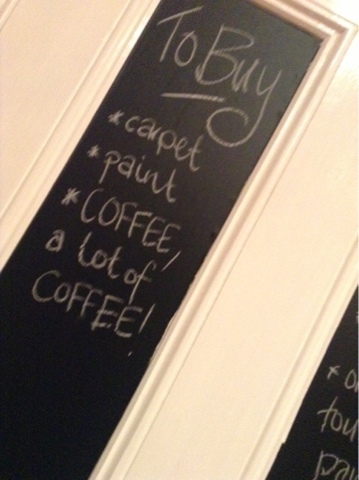 Just as well there are plenty of ideas on Pinterest to keep busy with. 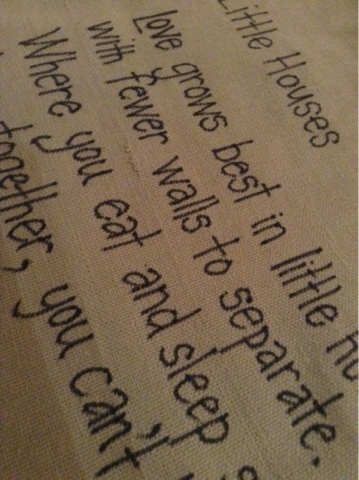 Today we are in the kitchen painting trim and this lead to today's Pinterest inspired creation! Everywhere you look on Pinterest there are chalk boards in all sorts of amazing places, styles, and shapes and they are so useful, especially in the kitchen. 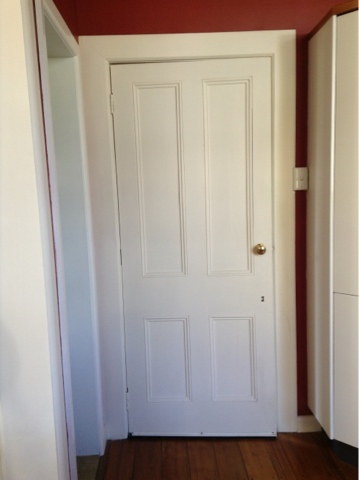 I did have to paint the door before starting to adhere the vinyl .... got to love an old house where all the white paint has gone yellow over the years and now takes four coats of white paint to cover what was white paint! Once the door was fully saturated in paint and had finally dried I cut two oblongs larger than the spaces they were to go in. This stuff was really really easy to put up and get crinkle free. 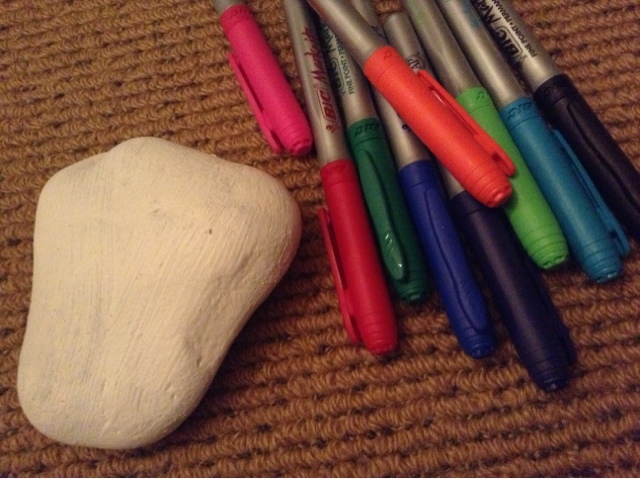 I then used a Stanley knife to trim around the edges before grabbing the chalk and giving it a go. 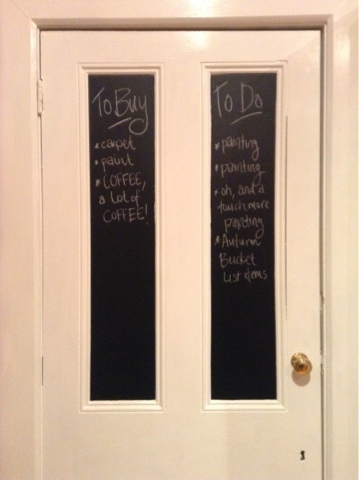 Worked really well and the old panel doors are perfect for adhering vinyl to so you can create ideal list size chalk boards. Job done ... I guess that means I should get back to the painting ... maybe after a hot drink ... and I've done some more of the puzzle we have started ... and I've done some blog hopping ... oh who am I kidding, it's late, I'll start again tomorrow! We have had the best weekend, our gorgeous and hilarious friends from our old haunt came down to see our new home and region ... we had the BEST time showing them around and being really proud of our new house and the lifestyle we are creating. I spent quite a bit of the time trying to persuade them to follow suit and move down this way unashamedly! As such, the house reno's took a back set while we spent time enjoying their company and the surrounding countryside ... we are truly blessed to live in the Hawkes Bay, yeah I might have mentioned that once or twice already :) We did manage to select the carpet for the house, go to Rush Munro's for the ultimate in ice cream experience, find an amazing organic cheese shop which lead to superb pizzas for dinner, AND tick off several Autumn Bucket List items! Not bad, not bad at all. Anyway, tomorrow things kick up a gear with the builders, electricians, and me with my paint brush all putting in a full week of work. 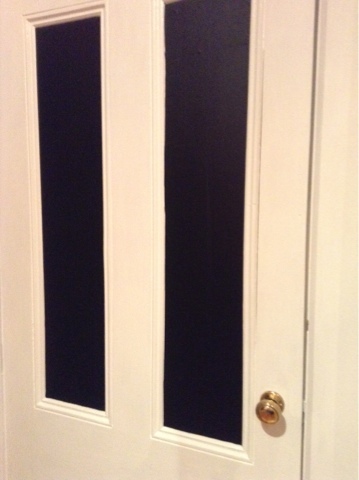 Tomorrow I take to the kitchen to paint doors and windows in there along with a chalkboard idea I have seen on Pinterest. And in the afternoon, I will attack Ben's walls now that all the trim is finished and, as promised, I have a very cool idea from Pinterest for the finishing touches on his walls ;) It's going to be a BIG week. 98 years ago New Zealand joined the World War 1 campaign and it is on the 25th of April each year we remember them. I have been to the dawn services since I was a young girl and it something I have ingrained in my children since they were littlies. For me it becomes more important each year as the old soldiers lessen, and for those that are left and reap the benefits of sacrifices made by those lost to war to remember them and honor those that paid the ultimate price. It is a day of reflection, of pride in what our very young country took on, and a day to be with family and good friends. It makes me so proud to see how many continue to make the early morning effort and pay their respects at a dawn service ... Kia kaha New Zealand. 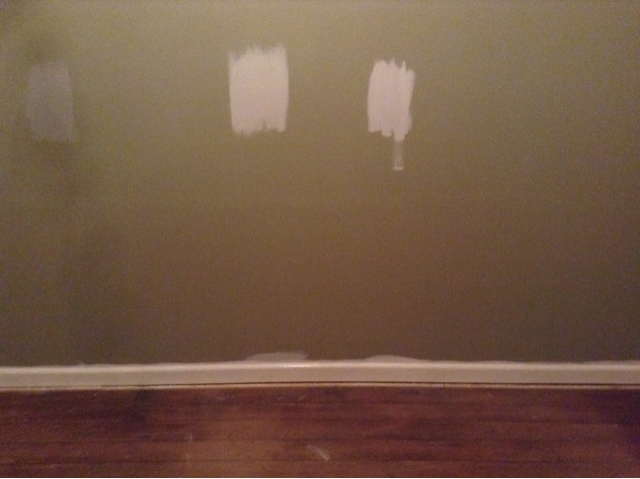 Without doubt the most useful advice I found was on the family handyman (http://www.familyhandyman.com/DIY-Projects/Painting/Painting-Tips/10-tips-for-a-perfect-paint-job/Step-By-Step). This website has ten great tips that get you started on the right foot. Let me tell you I learnt a thing or two today that I definitely put into practise and even my sweet husband had some happy comments about my painting efforts today. Having very little to come and go on over the next 18 months is going to be a new reality for us, not only does the house need our money so do Ben's teeth. Both worthy causes and I wouldn't have it any other way but that means financial changes for our household. One of the big things we need to change is how much we spend on groceries, food in general really. We have a fairly healthy diet but for the last six months we have spent a huge amount of money on convenience foods ... still cooking and baking at home but with the help of quick fix items so meal making and baking are easy. 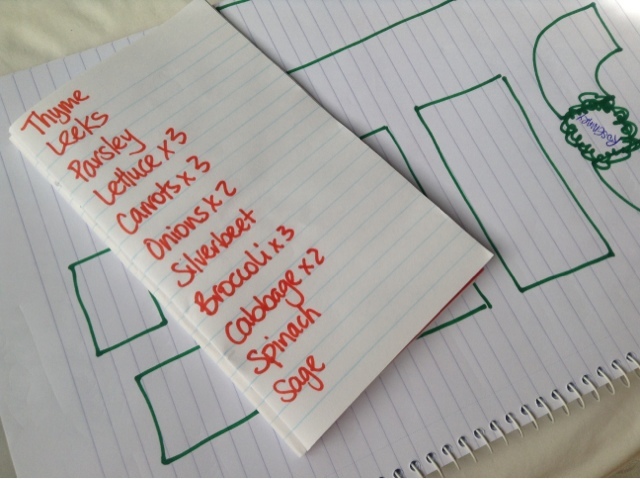 It's time to go back to basics and half the grocery bill and make our food shopping go further! I have been doing some research on Pinterest and there are lots of wonderful families, Mums in particular, that have plenty of ways to make your grocery money go further and still eat a healthy, wholesome diet. One of the best websites I read while doing this research today was Lisa's from true food movement (http://truefoodmovement.com/30-day-wrap-up-whole-foods-thrifty-challenge). She and her family did an experiment to see if they could live well on $500 a month only eating whole foods and organic produce. She wanted to see if it could be done without compromising the quality of your diet AND she succeeded! It's a great read and there is PLENTY of wonderful advice and funny stories Lisa shares throughout the month long journey. It made me realise that I too could live off $500 a month for groceries and have a well balanced, healthy diet. So that's what we started today - $500 a month for food and that's it. I remember when Steve and I were first married and were at University studying, working part-time, pregnant, and with a mortgage we made everything go along way because we had to. The last several years we have glided and made life too easy and spent way to much on convenience because we always seemed to be so busy. Life in Hawkes Bay is much slower and I have the time and desire to be more self-sufficient and less reliant on ready made groceries. - Use what you already have in the pantry and freezer, you will be surprised about how much you can make with what you already have on hand. - Don't meal plan, you never know what's going to be on special so make the most of what specials are there when you are at the market shopping ... totally found this to be true today, I went to get some things for lunch today as we had family join us. I went with an idea in mind but when I got there found a chicken half price and yesterday's bread bundled up at under half price. We had chicken and salad for lunch. 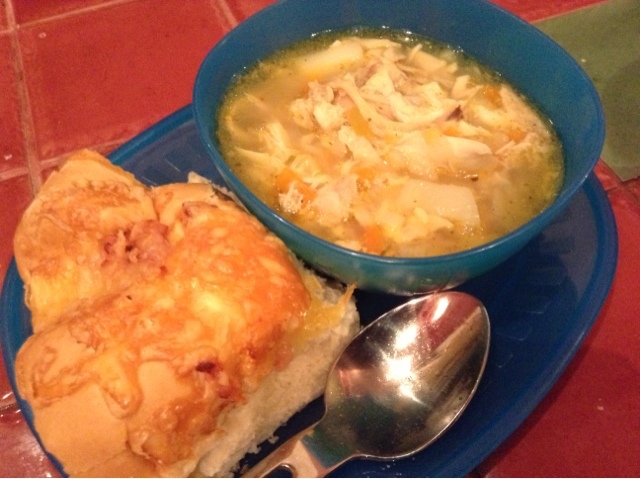 Then I used the leftover chicken and carcass to make a homemade chicken soup for dinner, with yesterday's rolls heated in the oven to freshen them up and they were as good as new, not to mention delicious! 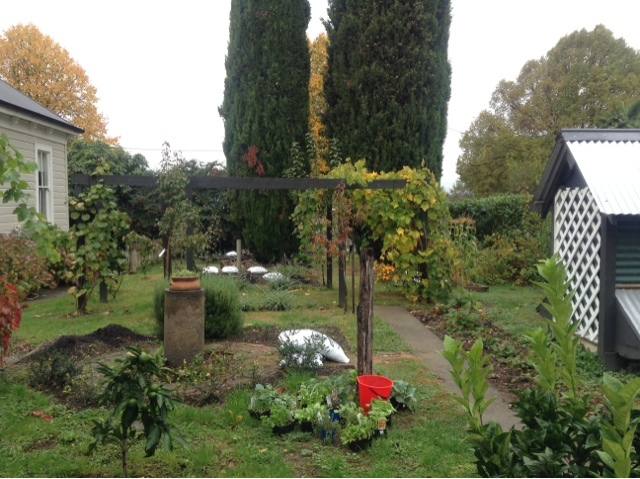 - Having a veggie garden is a must ... the last owners left some veggies in the garden and my sweet in- laws dropped off some pumpkins, fresh figs, and heaps of feijoas. Since we have been here I have only purchased one bag of potatoes, onions, and 3 bulbs of garlic, the rest of our fruits and vegetables have come from our garden or our families garden!! - Tiredness is no excuse for convenience shopping! Plenty of blogs I read today said it was harder to organise and pick up takeouts than it was to cook a quick dinner at home .... I am definitely going to have to remember this one! - Only buy what you need right then, if you buy in bulk it might sit in the pantry or fridge and never get used and that would be a terrible waste of money AND food. There are so many ideas in Pinterest and it provided me with so much enthusiasm for spending less and making the groceries I do buy go a whole lot further! Hopefully there are more half price chickens at the supermarket in the near future because the homemade chicken soup was so good!! The school holidays have started and with so much focus on moving and the house I needed something to make sure we didn't forget to have fun this Autumn! Bucket lists are SO handy for this and they are a gentle reminder not to let a season or holiday go by without having a bit of fun and trying something new. Lets face it, they are also easy to do and cost as little or as much as you want them to. I used some scrapbook paper, sharpies, an empty wall, some wall tack, a smidge of time, and a little help from the peeps for some ideas (and dreams). As the season unfolds you work your way through the bucket list choosing to fit things in as you can. I tack mine to the wall and then once something is completed off the list in gets taken off and thrown away ... very therapeutic! 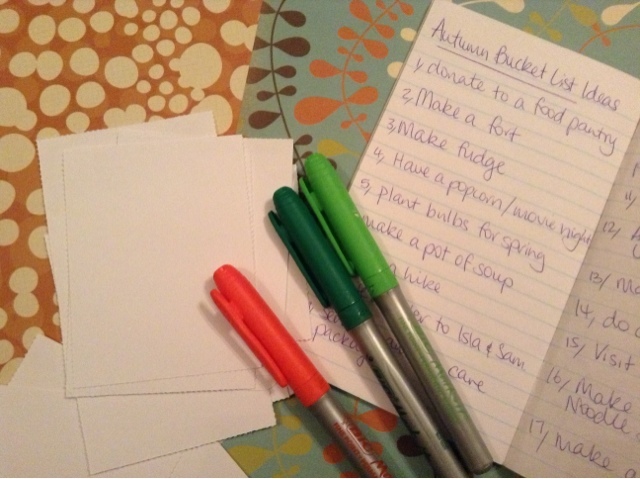 You know without Pinterest I never would have known about using seasonal bucket lists to add a little fun into each new season or holiday. There are many wonderful bucket lists and ideas available on Pinterest or make it up as you go with what works for your family! When I first did Pinterest 365 in 2011/12, I did one for Winter and it was so much fun the entire family loved it. Sometimes you need a little bit of help to get the family organised into spending quality time together doing a family favourite, trying new things, or simply just being with one another in this busy world. I decided Pinterest creations were going to happen around the fire today, in particular, the creating of some garden markers. I am close to several rivers that are currently full of rocks and no water so making rock ones seemed like a logical choice. I really liked the stone markers from homestead survival blog. 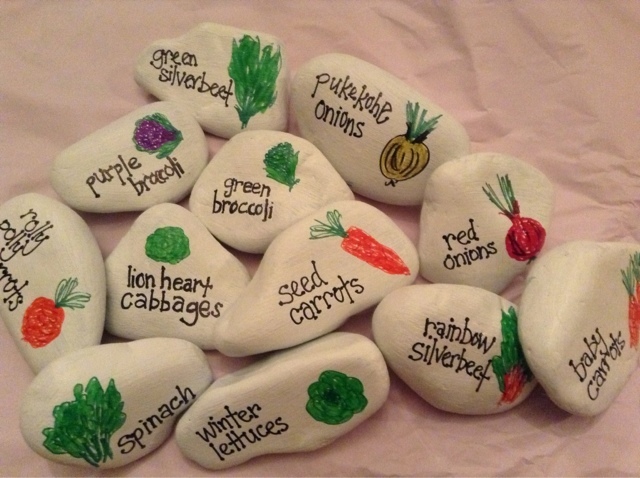 Unfortunately the actual blog no longer exists but the inspiring pictures of their veggie markers do! The picture of them is on my Outdoor Spaces board on Pinterest. 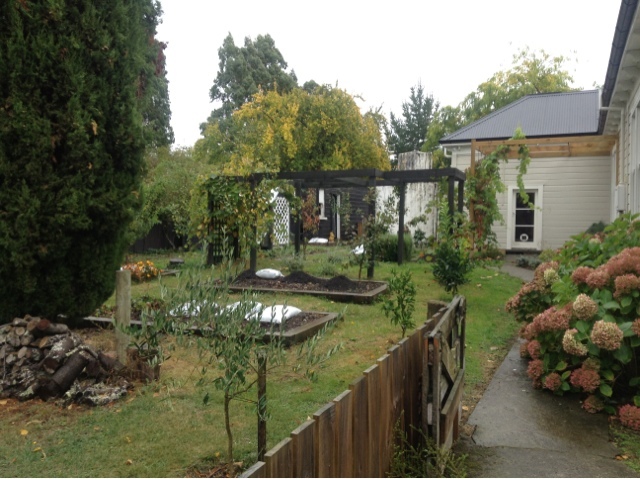 I painted all the rocks a cream colour so they really stand out in the garden and don't get lost in the soil. 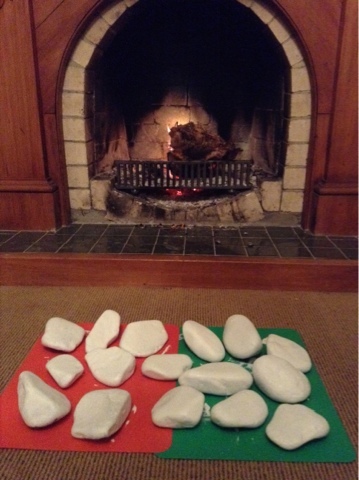 It was the perfect project to do in front of the fire as the rocks dried really quickly after I cleaned them and by the time I had painted the last rock cream the first one was dry and ready to decorate with sharpies! I am hoping the sharpies will stand the test of the outdoor environment and last so they can be used over and over again. 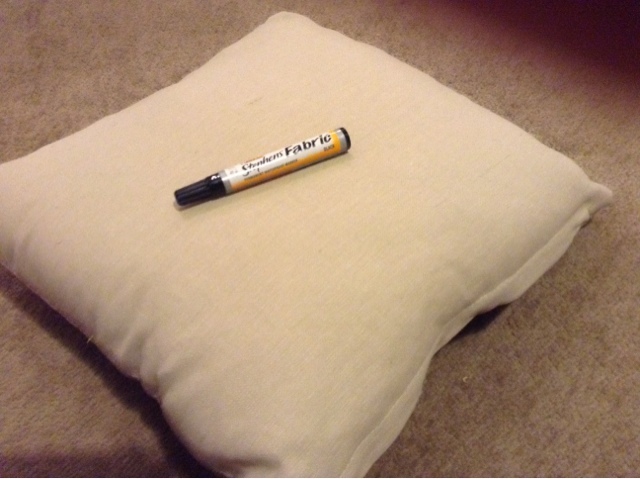 Before I put them out tomorrow I think I will give them a coat of polyurethane to add an extra layer of protection. 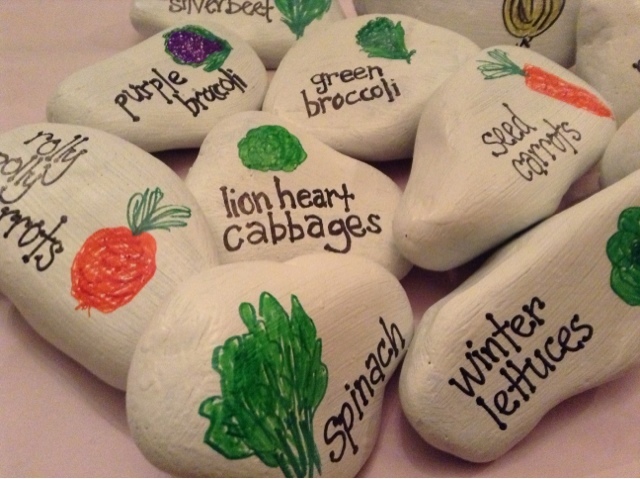 All the rocks were labeled with the details because we planted several different varieties of a number of vegetables. I figured at the end of each varieties cropping we could keep the rocks of the prolific veggies and toss those that didn't grow so well! Hopefully over time we will end up with a collection of rocks that are the tried and true varieties :) you can tell I am a novice veggie gardener because I so full of hope for bumper crops! Thank you homestead survival blog for your cool idea for veggie markers it was the perfect inspiration for today's project! 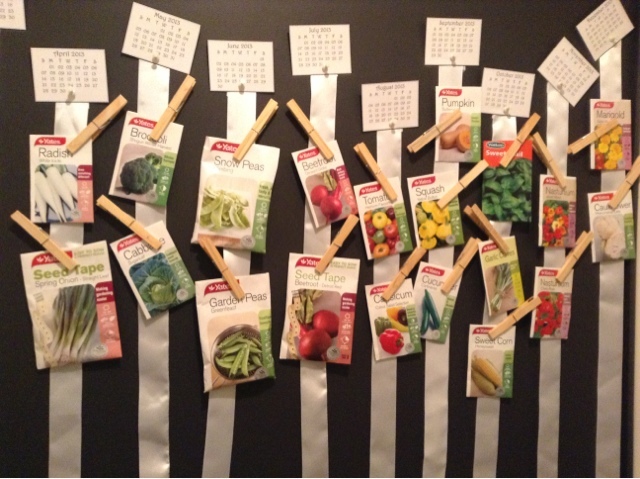 Seed Organisation for the novice gardener! I'm a girl that likes organisation, in fact, I thrive on it. If its not organised, chaos rules and I get overwhelmed and find it too hard to get anything done! I figured if I have to charged with all things garden while my sweet my is in Singapore I am going to have to have the planting and seeds organised otherwise it just won't get done! If the seeds are sitting in a box they will probably be forgotten and I will have to spend extra money on getting seedlings as opposed to planting my own. Thank heavens bhg have a great idea that will solve my organisational issues AND remind me when seeds need to be planted! 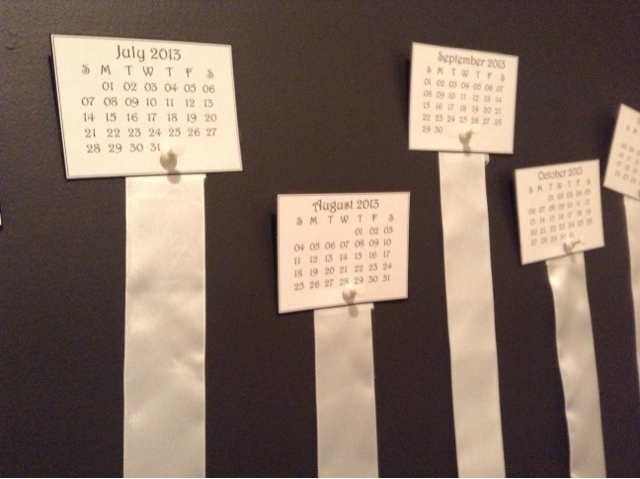 I love the idea of having ribbons hanging for each month of the year pegged with the seeds that need to be planted then .... what a cool idea and such a pretty way to organise them too! The bhg idea is also pinned to my Outdoor Spaces board on Pinterest. We do have a potting shed out the back, it needs some work, A LOT of work and you will see it next week as the overhaul on it begins. 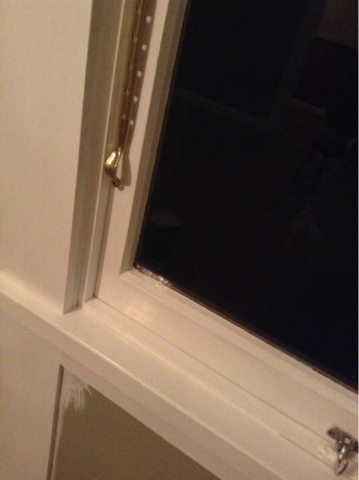 In the meantime I have hung my handy dandy seed ribbons inside the back door. Thanks to bhg for making this novice garden much more organised and if anyone comes over they'll think I am SO green fingered ... I won't tell if you don't! 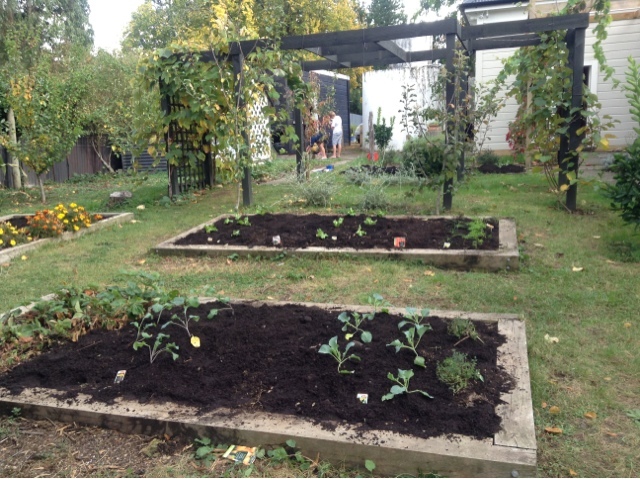 The veggie patches ready for winter crop picking! I don't have green fingers, I never have. I find it extremely ironic that both my green fingered mum and sister are both in Singapore and I am the one here surrounded by gardens that need cultivating and planting with winter veggies. 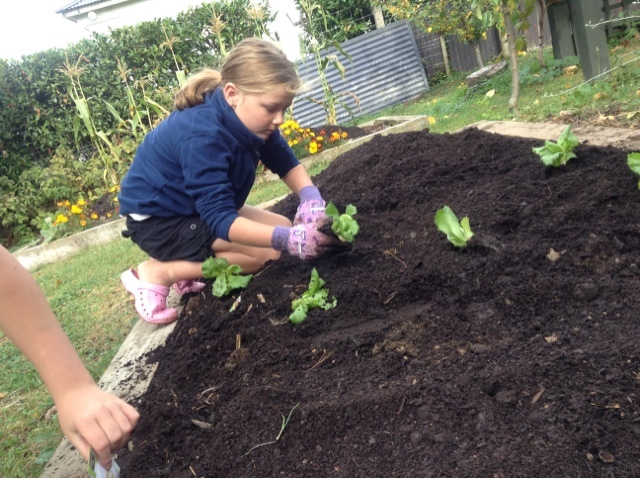 I started with composting all the veggie patches then wondered what one should do next. Luckily the local garden centre helped me with the guidance and purchasing of veggies suitable for this time of the year. I know my mum is hugely into planting things next to things that help each other grow and deter pests. Apparently this is called companion planting, a subject I know next to nothing on. Lucky for me I am on a first name basis with a site that has the answer to every predicament, Pinterest! If you pop companion planting into their search engine all sorts of beautiful and informing imagines come up to greet you. Now the reason Pinterest and I are such firm (firm) friends is I'm a visual girl, so the info-graphic put together by Lifehack was just the ticket! My workforce was of a younger nature today so I know they also appreciated the visual guide as opposed to a written article ;) The linked image is also pinned to my Outdoor Spaces board on Pinterest. The perfect companion planting info-graphic you can source from lifehack. With my newfound wealth of information on companion planting, I sat down and drew a rough sketch and made a list of all the plants I had purchased. With the info graphic I gradually made a plan making sure I put plants that got along next to one another. 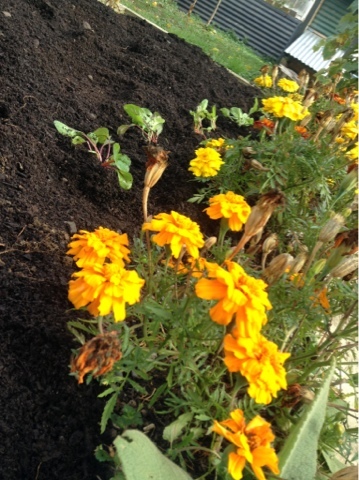 I also learnt that plants love having nasturtiums and marigolds around because it helps keep the pests away, so I made sure we added some of those to each garden! 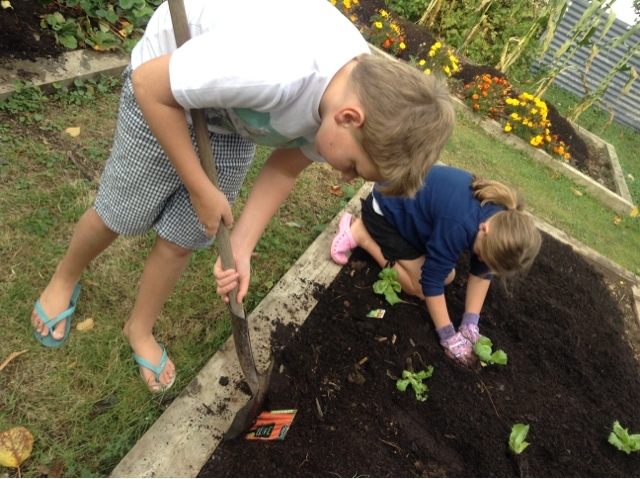 Then I rounded up the workforce and we placed the plants out before planting them in our newly cultivated land! 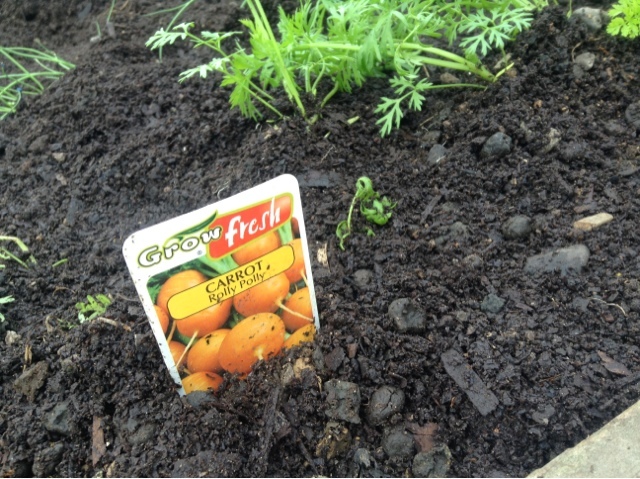 Only time will tell whether I have managed to successfully plant out our winter veggies but I will keep you updated. What we do know is thanks to Lifehack these crops have a fighting chance as they have been planted near friends and removed from foes. Amazing, even plants have their clicks. I guess all living things have their social grievances, if we could all just get along planting and life would be so much easier! As with all decisions we make, each has its ups and downs. 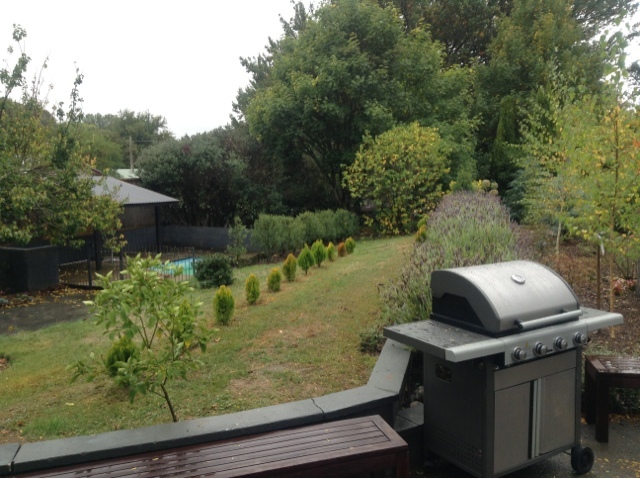 One of the downs for our decision to move to the Hawkes Bay has been "the work compromise". As a home schooling mum, we live on one income, which needless to say we value greatly! My husband, Steve, has a great job that he enjoys located in Auckland and we didn't want to give that up moving here, so we haven't. It's a one hour flight commute he does at the beginning and end of each week and lives in what we affectionately call "the box" while he is in Auckland. 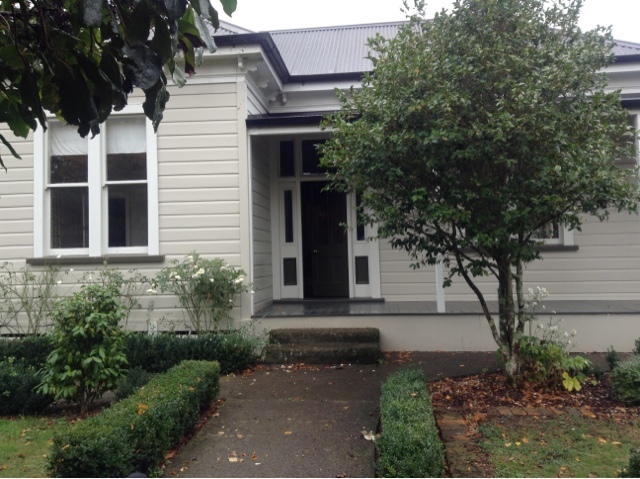 It is a tiny room in an apartment building, it isn't ideal but it works well enough for him to continue working in Auckland. We miss him heaps during the week, but things like Skype, phone calls, and emails really help. Each day Steve chats with the kids and always asks what they have been up to ... it's fair to say he gets a mixed response to this question depending on how tired the peeps are and how distracted they are by other things ;) I wanted to make sure that Steve didn't miss out on the everyday things from not only my point of view but also from the peeps. As always I found the answer on Pinterest! Positively Splendid had a guest post from Kiki Creates for dinner time doodle mats that were designed to keep kids entertained before dinner was served. The idea is also pinned to my Ideas for Organisation board on Pinterest. She has several free designs that are free to print off and laminate for your own peeps. I loved the placemat she designed as a comic strip so kids could draw the "story of their day". I figured this was something the peeps would love to do as they enjoy drawing and it would provide a visual aide when they Skype with their Dad and he asks the inevitable question "so what did you get up to today". I have limited supplies at the moment with the household in storage so I went to the local library and created a comic strip for telling the story of "our Hawkes Bay day" and printed several off for the peeps to use. No laminator at hand so the peeps, are using a new print each day. Once the laminator finds its way to Otane I will make permanent placemats, which they will use whiteboard markers on and clean off each morning. 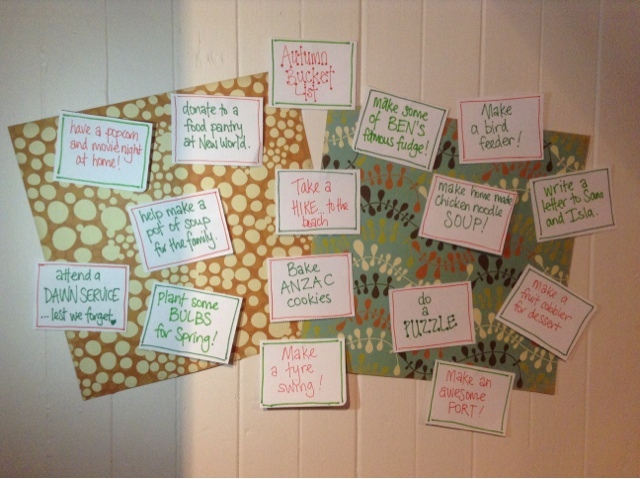 My thanks to Positively Splendid and Kiki Creates for sharing this awesome idea. I love ideas that provide kids with different ways of communicating and this one definitely fits that bill! Pollyanna busy at work .. Uh, I mean play! Thanks to some very sound advice (thanks Jenny!) 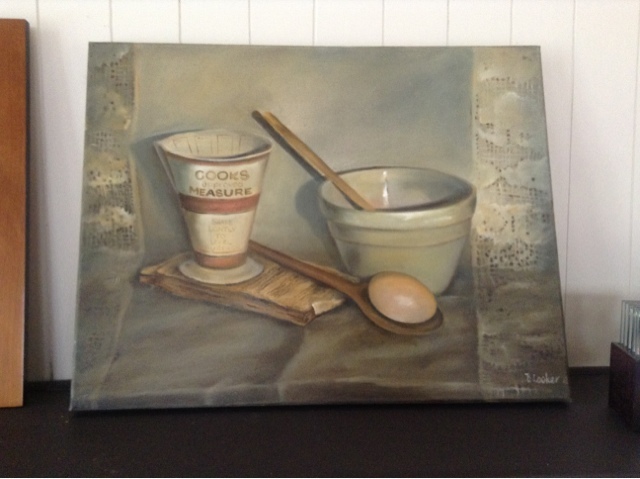 I am making progress on adding photos to my blog more easily using my iPad ... I know it's shocking that I am this technically poor but I really am! 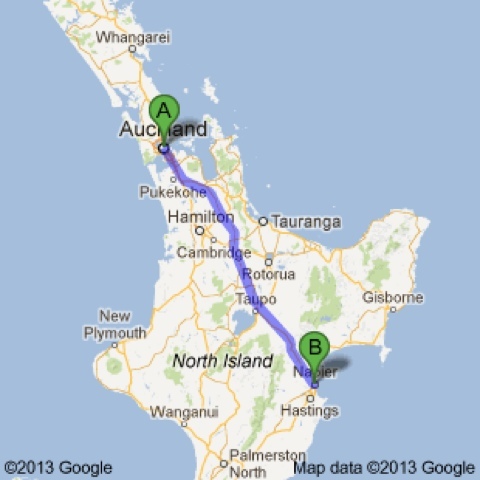 Any ho, below are some of the house and also a map that shows our move from Auckland to the Hawkes Bay. The piece of artwork was done by Brian Looker, the artist we purchased the Orphanage from and was the piece i asked to be left behind as part of the chattels. 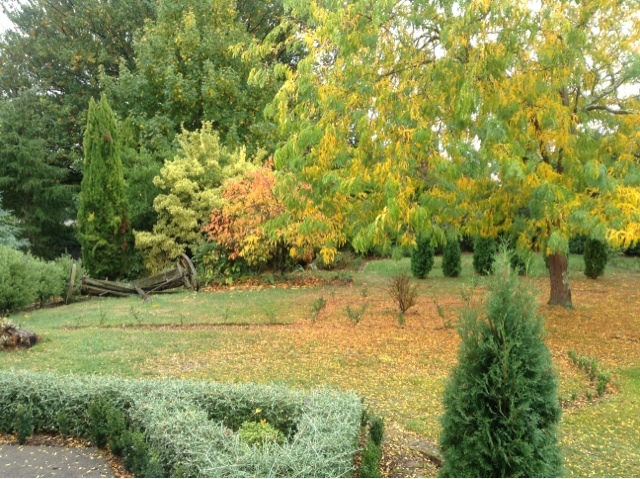 its Autumn in New Zealand so the trees are slowly losing there leaves which is a shame because they look so pretty at the moment! Later today I will post the first of 365 Pinterest inspired projects for this year! We have been very blessed with finding the right home on the market when we were needing to buy! It turns out it is nothing like what we intended to buy but when everybody loves it and you can't imagine another house matching it ... well ... who are we to argue with fate! The house was originally built as an orphanage in 1894 and is nestled in a gorgeous little village. It is known as St Hilda's and its latest reinvention was as an art gallery with a live-in artist. Brian Looker, does gorgeous work and we made sure a piece of his art was part of the settlement so the house would continue to have a part of its most current history. It's had a lot of love over the years and it still needs some more. It needs completely rewiring and, thanks to toughened insurance policies, all the scrim removed. 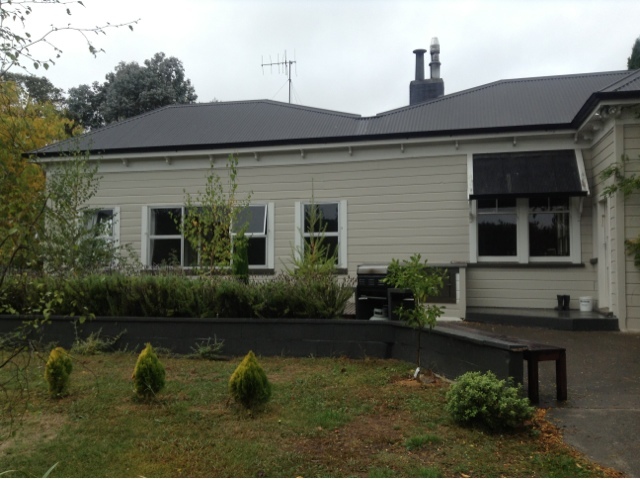 Apart from that the rest of the house has stood the test of time and just needs modifying to meet the needs of our family. As many of you know I live in an extended family situation with my husband Steve, two peeps Benjamin and Pollyanna, my sweet mum Dianne, and our black cat Cookie. The peeps are home schooled and we love having family, friends, and extras to stay and this house caters for all of that and more. 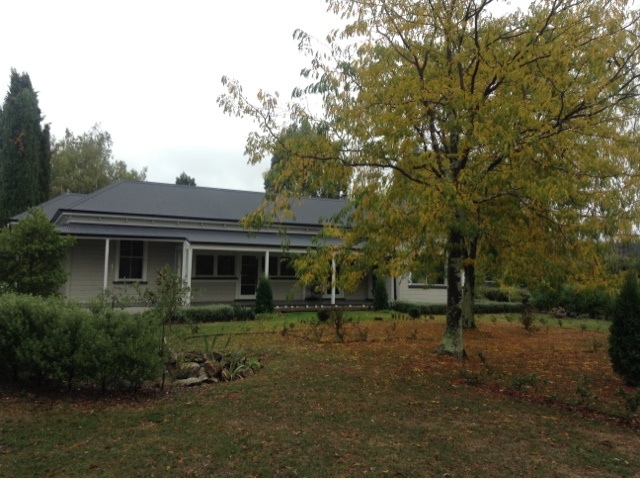 It has five bedrooms, a lounge, family room, and an open plan dining and kitchen. Did I say how grateful this house was on the market just when we needed it?!? You can see why we need rewiring! To make things just a little complicated, we have decided to wait to move our furniture in until all the scrim is removed, the electrics have been renewed, and the house has been carpeted. So we are currently camping in one room of the house ... literally. That means the early days of pinteresting this 365 days will include a lot of outdoor activities, ideas that will help our current living situation, and things that I am using with regards to the peeps education! There are only two photos because i am technically inept and cant figure out how to add photos and scroll from my ipad to my blog ... i will work on my ineptness over this afternoon and see if i cant figure it out for tomorrows posting so you can see the progress!! All my posts are being done on my iPad, which I don't really know how to use! Hoping that as we gradually get all our belongings out of the storage unit, the computer will turn up sooner rather than later to making blogging SO much easier! For a year of Pinterest style renovations, recipes, and outdoor solutions ... CAN'T WAIT!